Hey CJ, how are the arms holding up. Also, March has come and gone, and DelubozParts doesn't have them up for sale yet. Any ideas? Hey, They are holding up great, had an alignment done and my measurement was off lol so goes to show you no matter how much you check, double check and triple check... nothing beats a good old alignment tech! Yeah delubozparts hasnt put them on the market yet, im also waiting for his notification on when the front control arms would be ready for sail... same boat at you at this point. The vendor that sold them to me has them for sale now to the public. I have a deep rattle noise, rear right side, sounds like the wheel well area, particularly over bumps. Aside from a rattle, how do you tell if the control arm is worn out/to be replaced? 1998 986 with 77k miles. Well if the you can get a rubber malet and bang on the arm and listen for metal tapping noises, the noise it emits while driving is much more audiable than hitting with a hammer but try to hit it in such a way that it moves forward and backwards because that is the movement that wore it out. If no rubber malet on hand, jack up the car, remove the wheel and wiggle and jiggle the arm with your hands, if you feel the EVER SO SLIGHTEST movement, then its worn. It should feel extra solid when you move it with your hands but if not, then its worn. 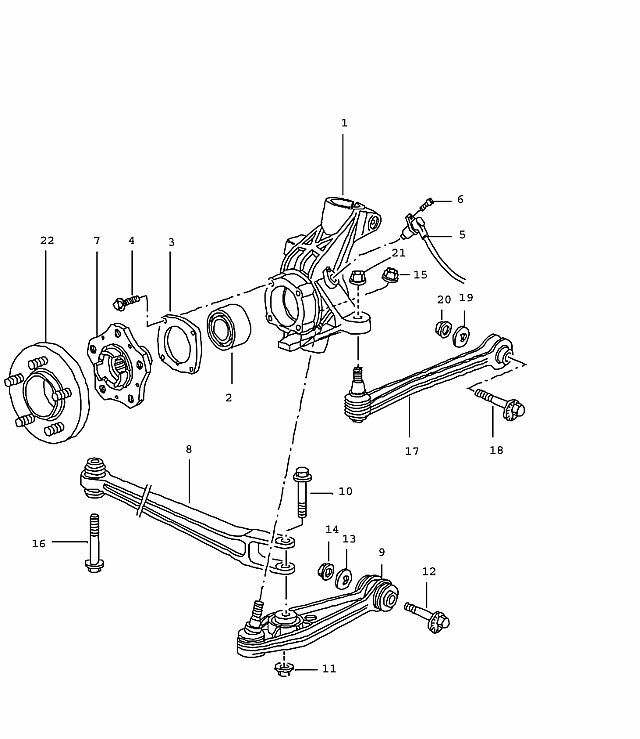 I noticed that your bolt in the upper control arm was in backwards or upsidedown to what they have in the parts diagram. they put them in this way. Bolt 10 and 11 nut. Yeah i noticed that too, That picture in the write-up was taken before i even took a wrench to it so thats the way it was installed by the factory, i think cause theres no room for a bolt that long to go in from the top, i think the diagram is mistaken. Where are the pictures referred to in the diy? They are referring to the Rear Suspensions Upper Control Arm/Track Arm. What I meant was the picture(s) you refer to: "5) Now you can see the Rear Upper Control Arm circled in red. That is what we will be removing/replacing." And also a picture I assume seafeye was referring to: "I noticed that your bolt in the upper control arm was in backwards or upsidedown to what they have in the parts diagram." Never mind. For some reason the browser on my other computer wasn't showing the pictures. Ok This is a DIY on how to replace your Rear Upper Control Arms (Track Arms), However I am not replacing the factory equipment with OEM Rear Upper Control Arms (Track Arms), I will be installing a Set of Adjustable Control Arms purchased from eBay Seller DelubozParts. A MUCH LESS expensive alternative inlew of buying a set of OEM Rear Upper Control Arms (Track Arms). If you have chattering or rattling noise coming from your rear suspension, Chances are that its a worn-out Bearing Cartridge on the Rear Upper Control Arms (Track Arms). Tools list: Floor-jack, 18mm Ratchet, 21mm Closed-End Wrench, Torque Wrench, 2 Vise Grip Pliers. 1) Get your floor jack and tool set out. Break loose the lug nuts and security lug on the wheels. 2) Remove the lug that is sitting higher than all others and insert/screw the threaded metal rod into that hole. 4) Remove the 2 plastic nuts that hold this plastic cover against the wheel well then remove Plastic cover. 5) Now you can see the Rear Upper Control Arm circled in red. That is what we will be removing/replacing. 6) Time to locate the bolt & nut that secure the "Fork-end" of the control arm to the suspension. Just look behind the Wheel hub, on the lower control arm and you will see this nut and bolt on top and below the lower control arm. 7) Now unbolt these by using a 18mm ratchet socket and 21mm closed end wrench as pictured below. FYI- Never hit a ratchet with a hammer... the internals will shatter. 8) After the 18mm bolt and 21mm nut are removed, Use your 18 mm ratchet socket to remove the 18mm bolt that holds the Rear Control Arm to the chasis. FYI- Its very very tight, try holding the ratchet on the bolt and sliding the closed-end of your 21mm wrench over the handle of the ratchet, Hold it firmly so the socket doesnt slip off the bolt and manage to get your foot on the wrench holding the ratchet and pull or push (depending on drivers side or passenger side Control Arm) until the 18mm bolt loosens enough so that you dont require the leverage of the wrench attached to the ratchet. Now place old control arm and new adjustable Control Arm side by side and slide one of the 18mm bolts through the Bearing Cartridge of the adjustable Control arm and into the Fork-End of the OEM Control Arm. Rotate the Adjustment bar on the Control arm until the other end of the Control Arm bolt holes light up perfectly. Once they line up, slide other other 18mm bolt through the other end to keep them from rotating anymore and make any other adjustments as needed. 10) Now tighten the Lock Nut on the the Bearing Cartridge side of the Adjustable Control Arm. Do Not tighten the Lock Nut on the Fork-End. Also rotate the Bearing Cartridge in the same angle that the OEM was while still in the car like so. 11) Now slide the Adjustable Control Arm into place by first aligning the Bearing Cartridge side first and screwing the 18mm bolt in only 4 turns. Now Slide the Fork-End over the mounting point and align it with the bolt hole. If needed, You may slide a screw driver into the hole to align the holes to better install the 18mm bolt. 12) Once the bolt is through the Fork-End, Install the 21mm nut and snug down the bolt, Dont torque it yet. 13) Use your Ratchet to tighten the 18mm bolt that is holding the Bearing-End of the Control Arm to the Chasis. Get it as close as you can to 160NM / 118lb-ft of torque with your ratchet cause you cannot get a torque wrench in that confined area. 14) Now using your 21mm closed wrench and 18mm socket on a torque wrench, tighten the bolt to 160NM / 118lb-ft of torque. 15) Now tighten the adjustment nut on the Fork-End of the Control Arm as tight as you can without having the Vise Grip Pliers slip off. 16) Now reinstall the Plastic Cover and its 2 plastic nuts and Place the Guide Rod back in the Top Lug Hole & Reinstall the Wheel with 130NM of torque on the lug bolts. I know this is an old post but I wonder if you have any updates on the arms you installed? How are they holding up, have they needed any adjustment, reliability? I need to replace mine as im getting that same "clunk" from the back and am wondering if this is a better/less expensive alternative to OEM. I wanted to see how the after-market arms are compared to the OEM. It looks like the after-market dont really have a bushing where the OEM Arms do. Anyone have any input on this? If all looks good, ill try an order the arms soon and let everyone know how it went. Also, with the "Clunk" sound, is everyone getting it form the very back near the control arm (with ball joint) or is it sound like its right behind the seats (thats where im getting mine). Is an alignment required after installation? Yes, perform a suspension alignment after installation. You are replacing the bad part because there was too much movement. Movement is exactly what you do not want in fixed suspension pieces - and it puts additional pressure and likely moves other suspension components. If it were my my car I would get an alignment. Gotcha. With that thinking, since only one arm is making noise. It would save me the cost of an alignment by replacing both arms together as opposed to seperately. Its possible you need both front and rear track arms but I cant say for certain, there are a few things (upper shock mount, sway bar links, brake pads missing tension spring) that can cause the same or similar "chatter". Your best bet is to take your boxster to an experienced mechanic cause at this point I'd be guessing. Is the forward bolt on the control arm just a bolt or do you need to get a wrench on the top as well? I'm trying to get this part out and hard to tell. Wanted to ask before I go crazy and wind up breaking something. Done this a few times. Get both ends started before you tighten everything up.